Only four years old, and already so big! On August 15, 2011, the very first players raced onto the Goodgame Empire server to populate this mysterious medieval world. Four years on, more than 70 million castle lords from all parts of the world have claimed their strongholds in the Great Empire, and we can look back on a terrific success story. In Goodgame Empire, players collect resources, prove themselves in battles against other players, and join forces in alliances. This basic principle has been in the game from the beginning, but the biggest part of the game came later. The other kingdoms – Everwinter Glacier, Burning Sands, and the Fire Peaks – first found their way into the game half a year after its launch. Since that time, new content has been added regularly, and the player community continues to grow alongside it. 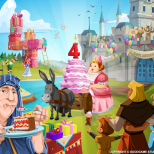 With so many players, there is always something going on in the kingdoms – altogether, the Goodgame Empire castles house 926,511,511 hard-working subjects! The castle lords collect 5,550,000,000 coins in taxes from these citizens day in and day out. The majority of the coins are invested in soldiers who fight 2,200,000 battles per day, followed by a fat sum of 19,000,000,000 plundered coins carried home in loot sacks. Not everything is about war, though: since the start of Goodgame Empire, players have founded 1,174,412 alliances and now send 1,175,000 in-game messages every day. Unfortunately, it still remains a mystery how many muffins the princess has gobbled up in the last four years! We’d like to take this opportunity to address our amazing players and fans directly: thank you for joining us on this incredible journey! Your constant feedback, praise, and suggestions have helped us make Goodgame Empire into what it is today. We’re looking forward to many more years with you to come! The talented team behind the strategy hit will continue to put all their efforts into developing new and exciting features for the game. You can already look forward to a new edition of the Berimond event, which was introduced as the first major multiplayer event three years ago. You’ll soon find out what foreign powers from the Far East are coming our way – so stay tuned!